Sorry, Thanksgiving Grocery is permanently closed. Even the most uncultured eater knows that French cuisine is rich, complex, and very, very fancy. American Cuisine? Not so much. Maybe that’s why it’s a little strange to see a specialty grocery store that exclusively sells U.S. food staples such as Jello Instant Pudding and Skippy peanut butter selling on the streets of Paris. But don’t underestimate the appeal of a hearty, American meal: the ingredients dehydrated, measured out for you, and stuffed in a tidy little box with instructions. Instant oatmeal, Heinz ketchup, and the fixings for Buffalo wings can all be obtained here, and Parisians and tourists alike flock to the American grocery every time they get a hankerin’. The store is cleverly named after Thanksgiving, the one meal that is a huge standout when it comes to cuisine from the New World. But any time of the year, ex-pats in Paris craving the comfort of home can find it here. If you’re going for some serious commitment to authenticity, the store also provides American-style libations. The owners of the Thanksgiving Grocery credit famous chef Julia Child with inspiring the foodie culture switch-out. Julia very famously moved to post-war France and fell in love with the sophisticated cuisine. She attended Le Cordon Bleu culinary school and went on to a very successful career de-mystifying French cooking for the everyday American cook through cookbooks and TV shows. 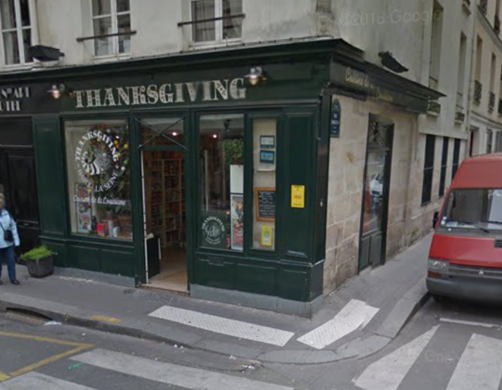 Like Julia, the store’s proprietor moved to Paris from America and became interested in the local cuisine. Unlike the famous chef however, she found that her immersion in Coq au vin just made her yearn for chili. She decided to delve back into the cooking of her homeland, but the ingredients seemed impossible to find. It was impossible to find more than half of the items she would require to make it from scratch. Thus Thanksgiving Grocery was born. If there was ever any concern that the grocery store would flop, it was soon alleviated. American food is happy food, and everyone likes to be happy, and who isn’t happy with a handful of Kellogg’s Pop Tarts?